T oday, Tuesday 17 May 2016, Metal announces the 2016 programme for Estuary, a new, biennial arts festival curated in response to the spectacular Thames Estuary. Historic venues along the Essex and Kent shorelines will host a mix of new and existing work pulling together powerful themes resonant to the place, its historic landscape and communities in an ambitious 16 day programme of contemporary visual art, literature, film and music curated by Metal’s Artistic Director, Colette Bailey with Gareth Evans, Sue Jones and Rachel Lichtenstein. Estuary 2016 is a vibrant celebration of the Thames Estuary and its bordering Essex and Kent communities. 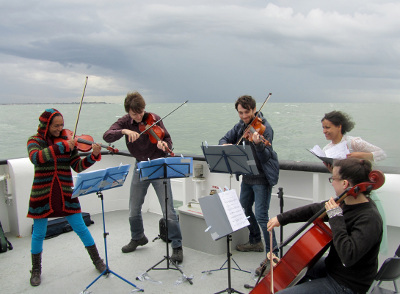 The inaugural programme responds to the region’s stunning geography, stories of those who have lived and travelled the water and land, the music borne out of South Essex and the people who at Tilbury Cruise Terminal have migrated and emigrated to start new lives. The cultural significance of the Thames Estuary as the gateway between the world and the UK will be highlighted through art commissions, festivals and events; large-scale participation and education projects; conversation and debate. The Thames Estuary is an ‘edgeland’, one of the great ignored landscapes of our time. It is a place of transition – one of arrivals and departures “at the co-ordinate of optimum transit and distribution, the place where all things gather and disperse” – a gateway that connects the UK to the rest of the world. It has been the front line for the defence of the realm as well as the first port of welcome for migrants and visitors from around the world. Industrial heartland and logistics sit alongside wild habitats, ancient monuments and concrete commuter towns. Echoes from the birthplace of early punk, noisy seaside fun, Brent Geese, fog horns and cargo ships create an unmistakable soundscape. It has long provided a source of fascination, inspiration and mystery for both artists and audiences. Points of Departure, curated by Gareth Evans and Sue Jones: an exhibition of new and existing work by 28 contemporary artists in the astonishing Grade II* listed Tilbury Cruise Terminal, waterborne venues on the Thames, and across the river in Gravesend, Kent. New commissions developed in residency at Metal by artists including Caroline Bergvall, Jem Cohen and Chloe Dewe Mathews will be exhibited alongside existing work connected to the site by John Akomfrah, Jeremy Deller, Adam Chodzko and others. Shorelines Literature Festival, curated by Rachel Lichtenstein: writers, artists, film-makers and performers explore the estuary and related themes, alongside tours of Tilbury Port and family activities. Speakers include Horatio Clare, Rose George, Deborah Levy, Ken Worpole, Patrick Wright and others. Lichtenstein’s new book Estuary: Out from London to the Sea (2016, Hamish Hamilton) will be launched as a key part of the programme. Walks spread over the landscape that inspired iconic works of fiction such as Joseph Conrad’s Heart of Darkness and Bram Stoker’s Dracula are recommended by contemporary writers and artists. 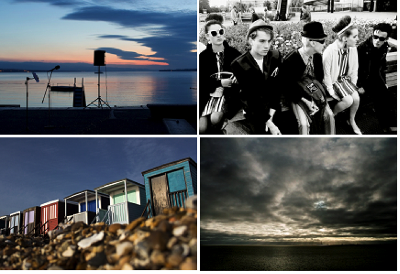 Inspired by Roger Deakin’s acclaimed documentary, Southend Rock, Sound of the Thames Delta brings together musicians, writers, artists, film-makers and broadcasters to examine the relationship between place and music, at the end of the world’s longest pier in Southend-on-Sea. Key figures from different music subcultures arising from the marshes of South Essex, spanning five decades, will form a series of panel discussions with live music and film screenings, with guests from further afield. Artists include: Chris Fenwick (manager, Dr Feelgood); John Fatman (resident DJ, Crocs); DJ Nihal (BBC Radio 1); Paul Morley, Pete Paphides, Laura Barton, Ruth Barnes, Zoe Howe (Looking Back at Me with Wilko Johnson), 2012 Cadiz Music Ltd; Lee Brilleaux: Rock and Roll Gentleman, 2015 Polygon); Chris Watson (Cabaret Voltaire); Martyn Ware (Human League/Heaven 17); Dean Chalkley (Junk Club photographer) and more. Museum of the Thames Estuary pop-up: ahead of the planned permanent museum in its proposed site within the cliffs at Southend seafront, a pop-up Museum of the Thames Estuary hosted in a shipping container will present a brand new collection of shipwreck finds from the estuary bed itself, recently accessioned into Southend Museum, alongside a new, large-scale drawing commissioned from Adam Dant that reveals secrets still hidden beneath the waters. Southend Charabanc: a weekend of culture, pleasure-seeking and sight-seeing in multiple venues and public realm across Southend-on-Sea in partnership with Focal Point Gallery, TAP, Southend Museums, Beecroft Art Gallery, Southend BID, Southend Pier & Foreshore and others. Wish You Were Here: ten specially commissioned artist-designed Beach Huts on Southend Pier take you on an artist-led journey through the Estuary seaside experience from the heyday of British seaside holidays to the present day. Much of the work has been developed in residence at Chalkwell Hall, the recently renovated four storey, Grade II listed, Georgian building that forms Metal’s base in Southend-on-Sea. Residencies form a core part of Metal’s work providing opportunities for artists working in all disciplines access to Metal’s spaces, the support of its staff and its local, national and international networks. Metal are working in partnership with four estuary local authorities, Southend­on-Sea, Thurrock, Gravesham and Kent and a wide range of regional agencies, business and arts partners, including: Capital Cruising; London International Cruise Terminal at Tilbury; The Port of Tilbury, Southend Pier & Foreshore, Port of London Authority, Thames Estuary Partnership, Southend Museums, Coalhouse Fort, Focal Point Gallery, Film Video Umbrella, Whitstable Biennale, Totally Thames, Artswork and ROH Bridge, Ideas Test, Kinetika, South Essex College, SEEVIC and South Essex schools.